World Keratoconus Day, November 10th, was established to help raise awareness about the effect keratoconus has on the people diagnosed with keratoconus, their family and friends. Keratoconus is a degenerative condition in which the cornea becomes progressively thinner causing a cone-like bulge to develop. Symptoms can include blurred vision, sensitivity to light, difficulty driving at night, and bright lights look like they have halos around them. 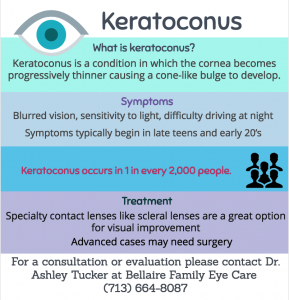 Symptoms of keratoconus typically begin in the late teens and early 20’s but can develop at any age. Keratoconus occurs in 1 out of every 2,000 people and hundreds of people around the greater Houston area have been diagnosed with keratoconus. Dr. Tucker specializes in diagnosing and managing patients with keratoconus. If you have been diagnosed with keratoconus or know someone that has, specialty contact lenses like scleral lenses are a great option for visual improvement. Patients from all over Texas travel to see Dr. Tucker for scleral lens fittings. Call us at (713)664-8087 to schedule an appointment or consultation with her today!